Post our flyer anywhere musicians and people who work with musicians and music can be found...and thanks! Need something specific or in a different size? 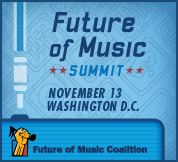 Just talk to kevin@futureofmusic.org and we'll be glad to help: 202-822-2051 x121. 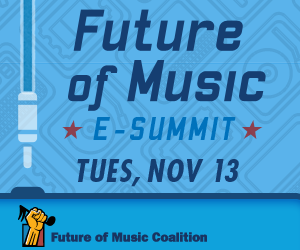 Please note: this link will feature other programming, unrelated to FMC before and after our live webcast, so you should embed the feed on the morning of the event and take it down immediately after. If you prefer to listen to the Summit instead of watch, catch the live internet radio stream on TuneIn. Thanks to our friends at Backbone Radio and TuneIn for helping make this great service happen! Can’t make it to DC? 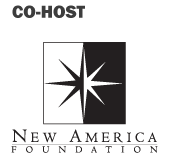 You and your local community can still benefit by organizing a local viewing party. 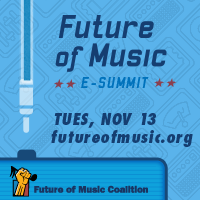 We’re calling it the “FMC 12 e-Summit” and we hope you can use it to build up the music community in your city or town. Bring together people who work in music and want to meet new people, watch, ask questions, talk and network! We got all the tools to help you make it happen! Find our latest event press release here. You can find select photos from 10 years of FMC on flickr.